My Friends are asking me to put up pictures of my house, so here it is for you Chelo and Kirsten. Please pray for Kirsten. She just had surgery and is not doing good. I love you Kirsten. This is the entry to my Master Bedroom. Double doors. I wanted to keep the bedroom dark. A great idea would be to add mirrors in the paneling of the doors. Very French. As you open the door, you can see a picture i love. Very romantique. It is the welcome to the area, introducing the mood of the room. I always take inspiration on my house art work do design the garden....Also good if designing for others. Can't go wrong this way. The bedroom should be your refuge, so i think that starting with your master when you put together your house should be the first thing you do. I wanted a tranquil, romantic, simple, aqua blue bedroom. I started with the aqua blue on the ceiling, the bed, a French reproduction(300$ at JCpenney.com). Then the chairs(Jc penney.com). Then the bedding, clearance at Walmart. The pillows, at Target. I bought the picture in a thrift store 8 years ago, the frame was Burgundy, i spray painted it gold. Surprise! it goes in my room. I guess, if you go with things and colors you love, you will find the use. The screen is from my husband grand-mother. his grand-pa got it in China when he was a soldier. It was a wedding gift for grand-ma. When grand-ma passed away, my husband's Dad gave it to me. It made me cry. So this is my favorite piece in the room. The colors are Aqua blue, chocolate brown, white, gold and off white. This is the side table on the other side of the bed where you can't see it in the picture above. I wanted to recall wood tones. Love the painted pieces. This is my side table lamp. I like to bring a little sparkle in bedrooms. Hard wood floors are a good investment. It adds value to your house and i SO love it! The ceilings are Aqua blue. The paneling is a plus for a Parisian or Paris Apartment style. This is real paneling but you can achieve a good result with molding and trims only. My house has a lot of white trims and paneling with colored ceilings. It makes the house flow, from room to room the same qualities are found. The Aqua ceiling is found in the whole house except for the kids bedrooms. It's beautiful and so serene. I love how you painted your ceiling aqua, it's very beautiful along with the paneling. Umm, hello amazing! Your bedroom is STUNNING! I love the paneling! How, how lovely is that blue ceiling. so serene. And I adore the paneling, very elegant. THank you for the tour! My goodness your bedroom is almost as beautiful as you are....love your room and your colors are prefect. Was thinking about you earlier today. You need to do a story and be on my new project that I started this past week. Everyone has a story...so tell us yours. GORGEOUS!!! I LOVE YOUR BEDROOM!!!! thank you for commenting my blog girl!!! I will be back here!!!! just gorgeous! i LOVE the chairs and the foot of your bed, and the pillows and bedding you have. GREAT JOB! Gorgeous, tranquil and I love the ceiling and paneling...but the screen... delicous and precious for the sentiment. I want to see the rest of your house... I bet is is wonderful. Also, I like your new picture on your header...you are beautiful as well with a great smile and blue eyes. Thank you for stopping by my little bathroom post. What a pretty room! I love that shade of blue and the moulding is a beauty. 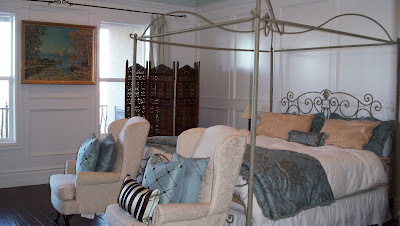 Fabulous bedroom - adore the iron canopy bed.. and the aqua blue celings - nice touch. Of course, all the white is just fantastic ! Your bedroom is beautiful and I like the aqua ceiling and paneling. Prayers for your friend Kirsten, I hope that she will be feeling better. It's really pretty! I love your bed! Oooo. I love the aqua blue ceiling ..my favorite feature! Your bedroom is elegant and serene, from the aqua ceiling to the dark wood floors. I love how you have created such an affordable sanctuary. The bedding is beautiful and compliments the gorgeous bed from JC Penney...how I'd love to find that! The paneling is a wonderful accent. Thanks for popping over. I have enjoyed my visit here! Your bedroom is so dreamy! I love the colors. The blue is my fave. I have been thinking of painting our master bedroom.... it is a warm rust right now... your white looks so fresh. I think I will go in that direction. Thanks for sharing. I like the soothing blue tones that you've chosen for your haven of peace. I'll pray for your friend. Bises de Paris... qui se remet doucement après la tempête d'hier! I love your bedroom, love the color blue for the ceiling, it's so serene. Your bed is gorgeous!!! Are you going to show the rest of your house? I am really looking forward to that, I was in it once and it was gorgeous. Your bedroom refuge is beautifully serene. Those wood floors look just like the ones we have picked out for Sea Cottage...though they are not real wood they are called antique hickory by Harmonics sold at Costco. Are yours real? This so inspires me. Love your style, your kitchen is amazing! I saw your comment about my bedroom and found your blog! Love it! Gorgeous room.... very classy, romantic and elegant... love it! How lovely...I'm off to finish reading today's post!